The South Korean government scrambled to play down concerns over the lifting of its unilateral sanctions against North Korea on Thursday. US President Donald Trump on Wednesday ruled out the possibility of South Korea lifting the sanctions on North Korea without approval from Washington, a sign of a possible discord between the allies over quickly developing inter-Korean engagement. South Korea’s Foreign Minister Kang Kyung-wha said at Wednesday’s parliamentary audit that the government had reviewed whether to lift the May 24 measures imposed following the North’s deadly attack on a South Korean warship. Kang, however, later backtracked on her remark, issuing an apology. The Foreign Ministry said in a statement there has yet to be a “full-fledged” review on the lifting of the May 24 measures. “There has not been a detailed review on (the lifting of the May 24 measures),” Unification Minister Cho Myoung-gyon said at a parliamentary audit of his ministry on Thursday. “Still, the government is maintaining a flexible stance (in enforcing the measures) under the circumstances we conduct inter-Korean projects amid improving relations between South Korea and North Korea,” he said, adding the previous conservative governments also did so. Cho noted there should be a “measure” related to the sinking of the Cheonan warship by the North for the May 24 measures to be lifted. The May 24 measures were imposed in 2010 by the Lee Myung-bak administration in response to the North’s attack on the South Korean warship Cheonan that killed 46 Navy sailors. The measures prohibit all cross-border economic cooperation except for a jointly run factory park in the North Korean border town of Kaesong and tour programs to Kumkangsan. New investment in the North has been banned, and North Korean ships are not allowed to use shipping lanes in the South. 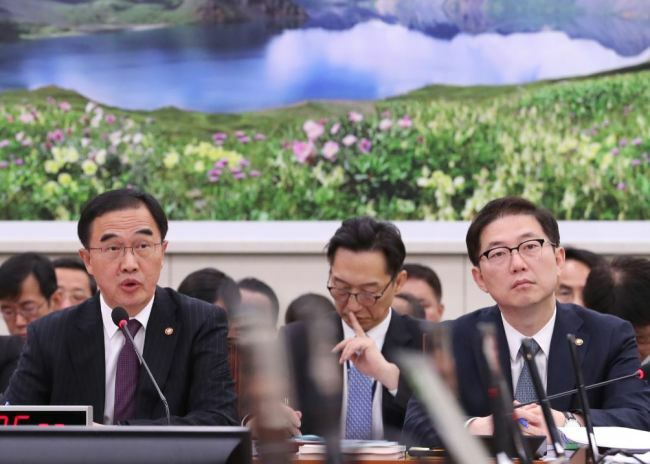 An official from the Foreign Ministry said that the government offered a detailed explanation on Kang’s comments on the lifting of the May 24 measures through diplomatic channels, and shared all the necessary information real-time at the parliamentary audit on Wednesday. The ministry spokesperson Noh Kyu-duk reiterated that South Korea is maintaining close coordination with the US at a regular briefing on Thursday. Criticism has mounted here over Trump’s remarks, which critics have labeled “diplomatic discourtesy” in country-to-country relations and indicative of Washington’s one-sided perception of US-South Korea alliance. Cheong Wa Dae said it took Trump’s words as the US seeking to maintain close coordination on every matter. Unification Minister Cho also said he took Trump’s words as “stressing” the need for coordination and cooperation on every matter. A lack of coordination between South Korea and the US was also visible when Kang said Wednesday that US Secretary of State Mike Pompeo expressed displeasure over the military agreement between the two Koreas during their phone conversations ahead of the third inter-Korean summit last month. Regarding Pompeo’s reaction, Foreign Ministry official said that Pompeo maintained a “polite” tone during his talks with Kang, and the matter was closely discussed between South Korea and the US militaries. But the result of the discussions was delivered to Pompeo belatedly, which could have prompted him to be slightly displeased. Sanctions relief is thought to be among the corresponding measures North Korea has asked for from the US in return for its dismantling of a major nuclear compound in Yongbyon. North Korea and the US continue their denuclearization talks, with their second summit in the works. While the US maintains North Korean sanctions should remain in place despite ongoing denuclearization talks with the reclusive country, China and Russia are stepping up calls for the easing of sanctions in return for goodwill gestures the North has already made. South Korea has sided with the US, saying sanctions should remain intact until North Korea completely denuclearizes and that inter-Korean projects will be pursued without violating international sanctions. The lifting of the May 24 measures alone would not allow South Korea to resume inter-Korean trade and make investments in the North, due to the United Nations sanctions that restrict a transfer of bulk cash into the isolated country. But it is expected to create momentum for the resumption of long-stalled inter-Korean economic projects such as Kumkangsan tours and the shuttered Kaesong industrial park, as the Moon administration eyes broader economic cooperation in return for the North’s denuclearization. The Moon administration has sought exemptions from international sanctions against North Korea to push forward cross-border exchanges this year amid a rapprochement in inter-Korean relations.